Rachel Harrington has toured the UK and Europe extensively over the last few years, mainly promoting her brand of country folk alongside a co-performer. On one such tour she was accompanied by ex-Lindesfarne UK folk legend Rod Clements and on a couple of occasions by fellow Pacific North West resident Zak Borden. However in 2012, Rachel has taken a different stance by developing a project based around a four piece all girl honky tonk band to hone in on her core musical love of traditional old time country music. This has led to the creation of Rachel Harrington and the Knockouts and they look set to meet the approval of the dedicated fan base that frequent the live venues up and down the country which actively promote touring US musicians from the Americana genre. On the third night of the UK leg of this tour, the girls were delighted to be greeted by a sold out sign at the plush Courtyard Arts Centre in Hereford. Over the next two and a quarter hours, the audience were treated to a comprehensive show where Rachel impressively fused a showcase of their new album with some of the familiar songs from her three previous full length releases. Apart from a couple of her older number which Rachel performed solo, the stage presence of percussionist Aimee Tubbs, bassist Moe Provencher and fiddle player Alisa Milner added considerable value to a varied set of old and new songs. The new songs all came from the recently recorded Knockouts self titled CD while the others were a mix of covers and ones from Rachel’s solo back catalogue. In line with the all girl nature of the collaboration, it was no surprise for the cover songs to be chosen from the work of some of the legendary female country performers. Patsy Cline’s ‘Turn the Cards Slowly’, Kitty Wells’ ‘Honky Tonk Angel’ and Loretta Lynn’s ‘Fist City’ were all celebrated by the Knockouts, with the latter seeing Rachel stand aside and let Aimee Tubbs take lead vocal. All the girls unashamedly professed their adulation to Loretta Lynn and her influence was very much heard on the material from the new album. ‘Makin’ Our House A Honky Tonk’, ‘Love Him Or Leave Him to Me’ and ‘Wedding Ring Vacation’ could all have easily been lifted from an era where the pioneering women began to make their mark in country music. Another memorable number from the all originally penned new record was the slightly tongue in cheek ‘Hippie In My House’ which raised a smile from the appreciative audience. When delving into her back catalogue Rachel chose a mix of songs where the Knockouts sound enhanced their delivery, especially ‘You’ll Do’ and the re-titled ‘Moonshine Boy’ while some of the more thought provoking numbers such as ‘Goodbye Amsterdam’ and ‘Building A Mansion’ were played solo. 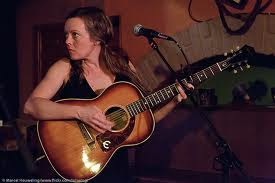 The latter recently gave her national recognition in songwriter circles with an award nomination and invitation to play at the renowned Merlefest in North Carolina. As with her previous UK shows, Rachel chose to end the evening with the gospel tune ‘I Don’t Want To Get Adjusted’ which in true country tradition was sung with all four girls off mic, assisted only by Alisa’s fiddle and the audience being invited to help with the chorus line. This was the perfect end to what was probably the best Rachel Harrington produced show to date and a hope that this collaboration isn’t confined to a solitary album and tour.